A very special recipe this time. One I created for a particular purpose: to honour my eldest brother Eddie, who died recently. The idea was simple. Find a beer brewed on the day of his birth and get Henry to brew it. Just one small problem. Turns out Eddie was born on a Saturday, when many breweries didn't brew. The best I could manage was one from the day before his birth. Eddie's funeral was last Friday and we brewed the beer the following day in Collingham, the village outside Newark where Henry has his Cat Asylum brewery. Dann and Martha - the artists formerly known as Pretty Things - were there to help. It all went pretty well. The wort tasted great and had the straw colour typical of Boddington's Bitter, which is what it is. I got to throw the yeast in, which was, at least, a change from adding the hops. Eddie was fond of a drink, like all the Pattinsons. I think he'd like the idea of a beer to commemorate of his life. We'll be giving some of the beer to his childrean and grandkids. Best beer-related story about Eddie. When he was a military policeman, he used a Guinness label as a road tax disc. Ron - so sorry to hear about your brother!! What a great way to honour a loved one!!! I reckon you deserve an extra pint or three for the beautiful gesture, Ron. Great story about the Guinness label. My condolences. Such a good way to celebrate his life though. Ron, sorry to hear about your brother. What a great eulogy to honor Eddie. Cheers! These days someone only has to have their cat die and they rush off to get a tattoo in their name,lay their emotions bare on Snapcrap or Twatter and set up a shrine urging neighbours to lay wreaths bearing the legend " miss you,moggie,u wuz the best." Aw hell, so sorry to hear the news.Great piece you wrote there, as always. Sorry to hear about your brother, Ron. But thanks for the recipe, I've been brewing Boddie's 1950s recipes supplied by Edd M on this blog for a while now, they have been gaining a following with home brewers here in Aus as well via a popular forum. I'll be giving this a go, have heaps of cluster in stock (used a lot in trad Aus brews) and will raise a few glasses to you and your family in due course. 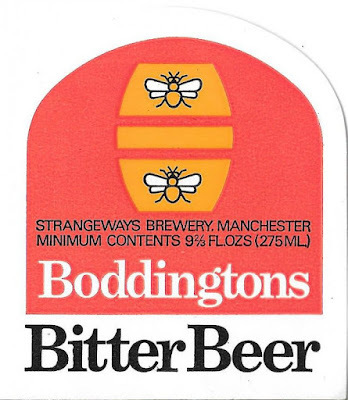 PS, and with respect, I find a better attenuating yeast for Bodds to be WLP 007 Dry English to get that "chewing on a pencil" dryness in a Bodds recreation, as I remember it in the 1970s when I used to pop over the Pennines to bother my cousin in Manchester. Sorry for your loss Ron, hope that it’s a great beer. Sorry for your loss. Never easy to lose someone close.